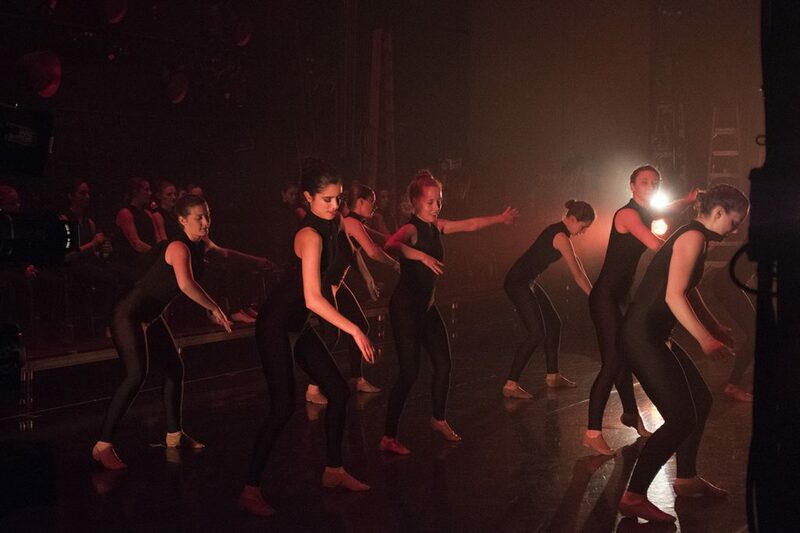 Remove the curtains and wipe the stage as clean as a blank slate, and you have Orchesis Dance Company’s 49th annual concert, Tabula Rasa. Spanos Theater’s stage has been transformed into an open space and will no longer mask the backstage areas. The dancers will sit lining the back of the stage for the entirety of the show. Directed by professor Christy McNeil Chand, the show ran from Jan. 18-19, and Jan. 24-26 at 8 p.m.
With this design of the show, audience members can choose to watch the dancers that are moving onstage, or pay attention to the dancer sipping from her water bottle or warming up backstage, which, according to Chand, makes this year’s concert a “fuller” show. The show features a variety of styles, choreographed by Chand, Cal Poly Professor Diana Stanton, faculty member Michelle Walter, guest choreographers including David Dorfman and his wife Lisa Race, Texas Woman’s University professor Matthew Henley and a group of student choreographers. 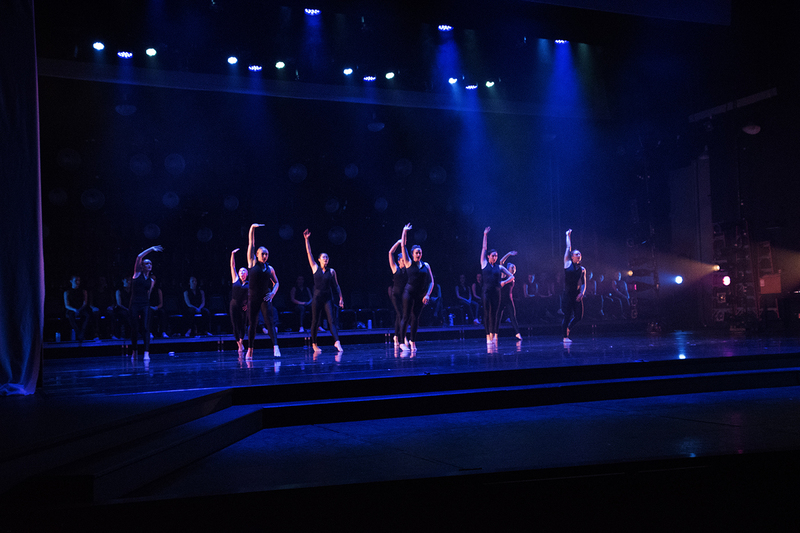 The show’s design includes work from students in Liberal Arts and Engineering Studies (LAES) under the direction of Professor David Gillett, in projections and lighting that will appear during some of the dance numbers and transitions. Student choreographers were selected by Chand, Stanton and Walter after presenting their ideas for a piece to include in the show. In selecting the students, they looked at how the students would showcase the theme and ideas in their dance, if this could be their last opportunity as a senior or if more opportunities for the student would be presented. 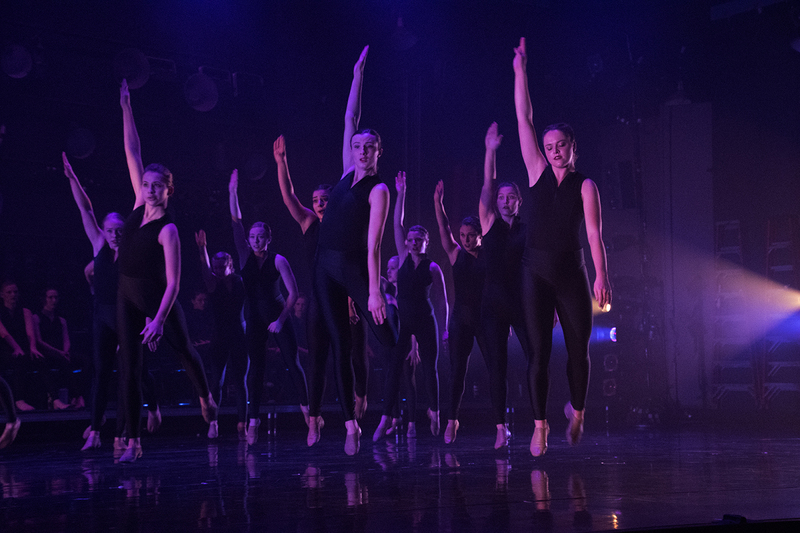 This chance to choreograph a piece gives student dancers the opportunity to showcase Cal Poly’s Learn by Doing motto, creating their own pieces based on the knowledge they have learned through their time with the dance company. Architecture sophomore Emily Chung choreographed one of the larger numbers in the show in a modern and contemporary style, incorporating elements of hip hop. When coming up with the idea for her number, Chung thought of the theme as starting over, and the impact we have on each other. Chung incorporated duet work and introspective individual movements to convey the theme. As a student choreographer, biochemistry senior Maile Crowder saw her work transformed. From the conceptualization of her dance to seeing the end result onstage, it has shown her how much a piece can change. For many of the dancers in the show, dance is something that they have done for a long time. For some, this concert is their last chance to perform with the troupe before graduation. “I really like Orchesis because none of us are trying to be professional dancers, but we all love dance so we put all this extra time into it because we love it,” Crowder said. The show’s theme itself breaks away from the tradition of hiding the backstage areas of the theater, inviting audience members to experience the show in a more intimate and open way. Now an audience member can see every moment of a dancer’s performance onstage, from entrance to exit and warming up in between numbers. In a traditional stage design, curtains create a box for audience members to view the performance in. By getting rid of these walls, audiences can see the sources of light and how they affect the perception and look of the dancers. Tickets for Tabula Rasa can be purchased at the Performing Arts Center Ticket office, by phone at 805-SLO-4TIX and online at pacslo.org for $20 for the public and $12 for students, seniors and children.